Linebacker Jake Ryan tackles former Packers running back Eddie Lacy during the first quarter of Green Bay's win over the Seahawks. 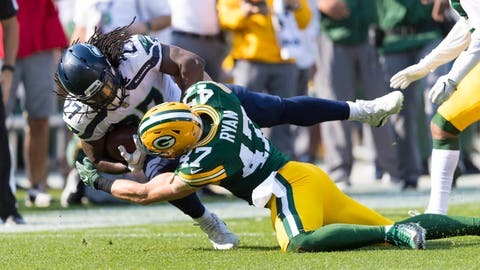 GREEN BAY, Wis. — The impressive season-opening victory over Seattle for the Green Bay Packers could have bigger implications in a few months when the NFC powers are jostling for playoff seeding. They wore down the Seahawks in a style befitting grind-it-out, postseason football. No shootout needed for quarterback Aaron Rodgers to win with his right arm. The Packers chipped away at Seattle’s vaunted defense with hard-fought yards from Ty Montgomery in the run game, and short passes through the air in the second half. And Green Bay’s own defense, often maligned last season for weak pass coverage, made a convincing statement by containing quarterback Russell Wilson and shutting down the Seahawks on the ground. When taking away two Wilson scrambles, Seattle ran for 50 yards on 16 carries. “I know it’s cliche, I know I probably say it every year, every game, but shut down the run, force them to pass and get after the quarterback,” linebacker Clay Matthews said after the 17-9 win. It worked to perfection on the strip-sack of Wilson by defensive lineman Mike Daniels on third-and-18 deep in Seattle territory, the momentum-swinging play of the afternoon. Montgomery bullied his way in for a 6-yard touchdown on the next snap to finally put the Packers on the board in the third quarter. Seattle opened the game with three three-and-outs. Daniels, Matthews and outside linebacker Nick Perry were in Wilson’s face all day as part of a withering rush against the Seahawks’ suspect line. “From a positive standpoint, I think the No. 1 thing was our play style. I think we had outstanding effort, pursuit, finish, had a lot of guys flying around the ball,” defensive coordinator Dom Capers said Monday. There were no pivotal lapses in pass coverage at cornerback, a position group that took a lot of heat last season. Solid coverage helped the pass rush, and vice versa. Against Seattle, Green Bay relied on what it calls a “nitro” package, in which the Packers use six defensive backs but line up strong safety Morgan Burnett as more of an inside linebacker. Doing that allows Green Bay to put more athleticism on the field to defend the pass while still having a solid run defender in the middle. “Definitely to win the game like that in Week 1, that’s definitely going to be beneficial down the road, that was kind of like a grind-it-out game, especially in the second half,” cornerback Quinten Rollins said. Now the Packers need to carry the momentum to Week 2 and a tougher challenge against the Atlanta Falcons, who are playing their first real game in a new stadium Sunday night. The Falcons blew holes in the Packers’ pass coverage in a 44-21 win in last season’s NFC championship game. Rollins plans to revisit the loss, as ugly as it might be, to analyze. But this isn’t the same defense either, the Packers say. “We’ll look at the film — they’re a new team, we’re a new team. It’s a new year,” Rollins said.